On January 21, dozens of people from Keene completed a 50 mile march to the New Hampshire statehouse to call for campaign finance reform. Hundreds of people marched from other towns around the state and met at the statehouse for a rally. The marchers left Keene on January 17. The march was organized by www.NHrebellion.org. Members of Congress take millions of dollars from rich people to pay for TV commercials for the politicians' election campaigns. Most of these rich “donors” want something in return. If they have employees they often want to prevent increases in the minimum wage (the richest family in the world, the Waltons, own Wal-Mart). If they own stock in Exxon Mobil they may want to prevent a tax increase on oil that could improve Amtrak. If they own a company that makes bombs for the Army they want to keep military spending high. Most rich people don't want increased taxes on rich people. So they invest in politicians' elections campaigns. "It's legalized bribery," said Fred Wertheimer, a nationally known campaign finance reform activist. The Sierra Club and the AFL-CIO support campaign finance reform. 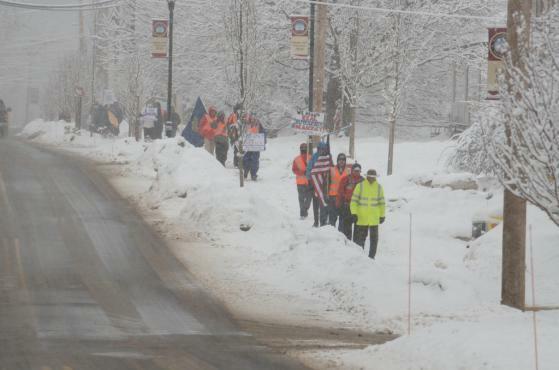 This photo shows people marching for campaign finance reform in New Hampshire in 2014. The 2014 march was also organized by www.NHrebellion.org.